Software Studies Initiative: new article: "Media Visualization: Visual Techniques for Exploring Large Media Collections"
new article: "Media Visualization: Visual Techniques for Exploring Large Media Collections"
Thank you everybody for your birthday wishes ! Lev Manovich. Media Visualization: Visual Techniques for Exploring Large Media Collections. The article presents the theory and the techniques of media visualization used in our lab, with the analysis of the examples. 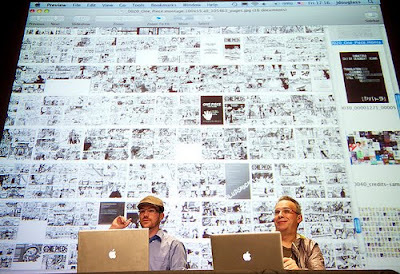 Lev Manovich and Jeremy Douglass discuss media visualizations of one million manga pages at the opening panel for Mapping Time exhibition, gallery@calit2.